The excursion starts by picking you up from the designated locations (which are available on the site). On our way to Elounda at approximately 10:15 we will make a short stop at the Monastery of Agios Georgios Selinaris. Around 11:30 we arrive to Elounda where we will take the boat heading to Spinalonga island. 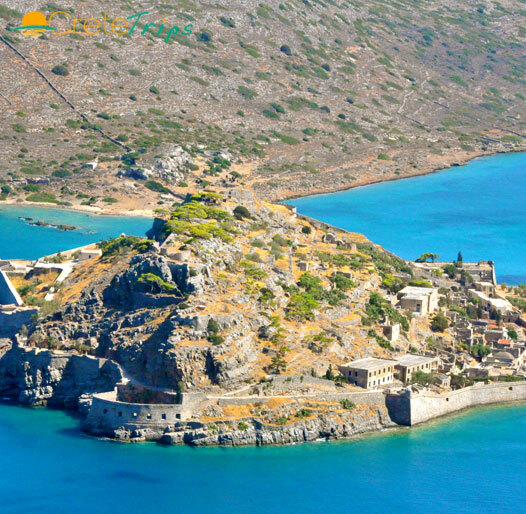 There you can travel through the venetians and turkish periods, roam through the old houses and alleys and explore the fortress to arrive at a more recent and moving part of history the first half of the 20th century when Spinalonga was the last Leper colony of Europe. After that we will be transferred to kolokithia beach where we will have lunch (barbeque). At 14:00 we will be back in Elounda where we will take the bus to Agios Nikolaos. Agios Nikolaos is a small and lively town where you can spend some free time at the lake, the harbor or the numerous little shops and bars. At around 17:00 we will leave Agios Nikolaos to return to Rethymno. You are expected to return at your hotel at around 19:00 although time of arrival varies depending on your destination. Bus transfer is operated by blue bus IAKOVOS. Transport to and from Spinalonga island, Agios Nikolaos. Experienced English, German, Russian speaking guide available throughout the trip.